No doubt, you treat it with special consideration and care. We use a highly effective method of pressure washing known as Soft-Washing. algae, grime and dirt buildup from your home’s siding, with no risk of damage. Learn more about Soft Washing below. Why should I choose Gibson’s Cleaning Solutions? Is Soft Washing safe on all materials? How often should I have my siding washed? Who will be cleaning my siding? Is Gibson’s Cleaning Solutions insured? 1. What is Soft Washing? Soft Washing is not power washing. Soft Washing is an effective and gentle method that uses low pressure to apply a mixture of water and cleaning solution to the siding, which removes mildew, algae, moss and dirt buildup. Soft Washing is the safest and most thorough cleaning method available today. 2. What’s the difference between Soft Washing and Power Washing? Soft Washing is a method that uses a pressure washer that has been adjusted to reduce the pressure of the water output but not the volume of water output. What that means is that the pressure washer still puts out several gallons of water per minute, but at a reduced pressure. Generally speaking, no more than 300 psi. Power washing can cause serious damage, such as dislodging siding or forcing water under the siding or soffits. It is a misconception that high-pressure is needed to achieve clean siding. Generally speaking, the only time high-pressure is needed is for concrete cleaning. 3.Why should I choose Gibson's Cleaning Solutions? 1. We have many years of experience providing property maintenance services. 2. We specialize in producing happy customers (See our Customer Reviews)! 3. We use the industry's best equipment and cleaning products to deliver the very best results. 4. All work is backed by our 100% Satisfaction Guarantee – If you don't like what you see, it's free! 5. Besides all that, we're reliable, friendly, safety-conscious, courteous, customer-service oriented, fully-insured and eco-friendly! 4. Is Soft Washing safe on all materials? Soft Washing is safe on Vinyl, Stucco, Dryvit, Brick and Stone. With any type of painted or stained siding, such as steel, aluminum, wooden clapboard, or wood shake shingles, there is the potential for some of the paint or stain to wash off. The older the siding, the greater the possibility. Soft Washing is also safe for synthetic or composite decks. 5. How often should I have my siding washed? RESIDENTIAL: Our prices are based on square footage of your home. 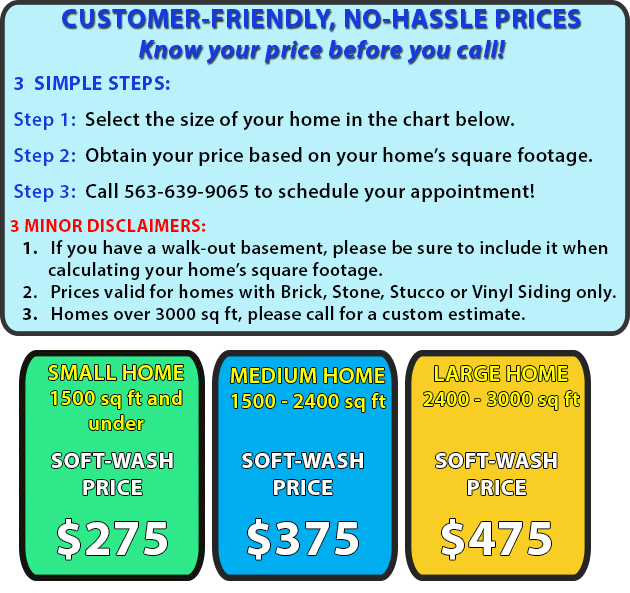 Look in the chart below to see if your home falls in our Small, Medium or Large category. Then select the service(s) you want to receive. Note: If your home is larger than 3,000 square feet, we will need to do an on-site custom estimate, so please call us at 563-639-9065 to arrange a day and time. COMMERCIAL: All commercial properties require a custom on-site estimate. Please call or email us to schedule an estimate. We are happy to work with your business to customize a cleaning schedule that fits your needs, budget and deadline. Estimates are free, no-obligation and generally take no more than 30 minutes. 7. Who will be cleaning my siding? 8. Is Gibson’s Cleaning Solutions insured? Absolutely! We carry two million dollars of liability insurance through State Farm. We also carry worker’s compensation insurance and additional insurance on our work vehicle. We will gladly provide a certificate of our insurance upon request. In addition to being properly insured, we are very safety-conscious. We take great measures to protect both your property and the safety of our crew. 9. Do I need to be home? This is entirely up to you! It is not necessary that you be home while we clean your siding. However, if you have exterior screens, we will need to come inside to remove them. We have developed great relationships with many of our customers who feel completely comfortable leaving a key or garage code to let us in. References available upon request. We generally schedule appointments about two weeks out. However, during the months of April, May, October and November, we can get very busy and at times it is three or four weeks before we have an opening. If you have a special event, please contact us right away and we will do our very best to accommodate you. Remember, appointments can be reserved up to one-year in advance.